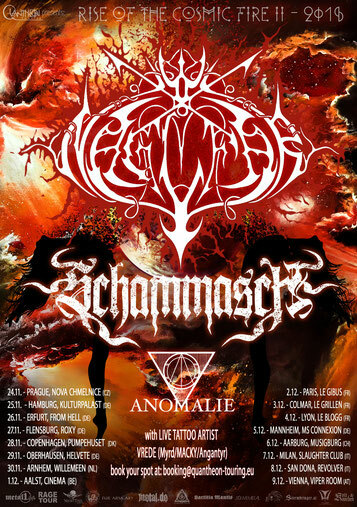 RISE OF THE COSMIC FIRE II: NAGLFAR, SCHAMMASCH, ANOMALIE - Realizing specific conceptual tour productions. THEY ARE BACK! With over a decade not being on tour supreme Swedish Black Metal authority Naglfar will return for a unique 16-dates pilgrimage through Europe with their recent re-release ‘Stellae Trajectio’ in the bags! Accompanied by no other than Swiss extreme Metal institution Schammasch who for the last time will play an extensive set concentrating on there frequently praised magnum opus ‘Triangle’ and recent EP ‘The Maldoror Chants: Hermaphrodite’. Anomalie, rising star from Austria who with their powerful and capturing energy turn whole concert halls of chatter into astonished silence will open the gates of this journey, being the second edition of QUANTHEON Touring’s series ‘RISE OF THE COSMIC FIRE’. A concept tour known to not only create a unique surrounding atmosphere for the music but also collaborating with renowned artists of the scene exclusively presenting their works. Exhibitions of talented souls such as French cover art designer Vincent Fouquet of Above Chaos, skull carver Kvlt&Knochen and C.S.R from SAROS Collective, Polish designer Cinthere, Irish painter Fuil.Arsa.Art, Dutch Photo artist Wendy Jacobse Photography, Italian Painter Leo HjArt, visual artist Sunvemetal in collaboration with English author Daryl Parson and craftswoman Laetitia Mantis will be featured.